• Wages and jobs in the Portuguese air transport industry, by Cristina Barbot, Pilar González, Luís Delfim Santos* [paper in English]. • Bus route evaluation using a two-stage hybrid model of fuzzy AHP and TOPSIS, by Ali Soltani*, Ebrahim Zargari Marandi, Yousef Esmaili Ivaki [paper in English]. • Linking activity participation, socioeconomic characteristics, land use and travel patterns: a comparison of industry and commerce sector workers, by Cira Souza Pitombo*, Eiji Kawamoto, Antonio Jorge Gonçalves de Sousa [paper in English]. • Urban freight movement by rail, by Marin Marinov*, Federico Giubilei, Mareike Gerhardt, Tolgahan Özkan, Evgenia Stergiou, Mihaela Papadopol, Luis Cabecinha [paper in English]. • Simulated annealing applied to the berth allocation problem, by Merhy Heli Paiva Rodrigues*, Catia Maria dos Santos Machado, Milton Luiz Paiva de Lima [paper in Portuguese]. • Feasibility study for establishment of a new urban corridor in the region of the Igarapé da Lavanderia through dynamic systems, by Vittorio Figliuolo Neto*, Maria Ivanilde de Oliveira, Jussara Socorro Cury Maciel [paper in Portuguese]. 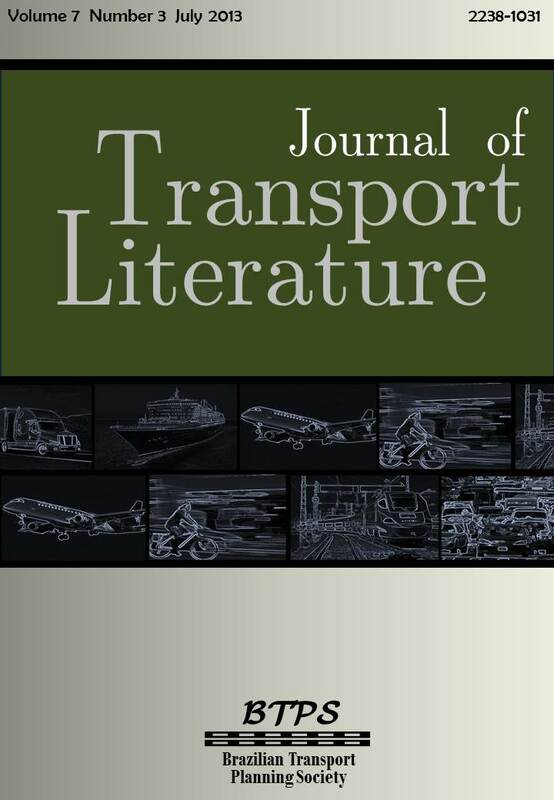 • Setting up a price-cap for passenger coach service: an alternative model, by Paulo Augusto P. Britto*, Carlos Henrique Rocha [paper in Portuguese]. • Optimizing the crew rostering problem for public transport systems, by Victor Teixeira de Melo Mayrink, Gustavo Peixoto Silva* [paper in Portuguese]. • Forecast model of supply and demand for hydrated bioethanol for strategic planning of transport in brazil , by Marcelino Aurélio Vieira da Silva*, Marcio de Almeida D'Agosto [paper in Portuguese]. • Governance in logistics platforms: an analysis of the elements and attributes to be considered in this type of enterprise logistics, by Rafael Mozart da Silva*, Eliana Terezinha Pereira Senna, Luiz Afonso dos Santos Senna , Orlando Fontes Lima Júnior [paper in Portuguese].